Nu represents the primeval Triple dark mass from which all the Gods were manifested from, and upon which millions of years of life was made manifest and that is containing the suns of the universe. His titles are Father of the Gods, and begetter of the great company of the Gods. Upon his head is the disk and plumes. Nut the female principle of Nu; she is depicted with the head of a snake surmounted by a disk, or with the head of a cat. Ptah is associated with the God Khnemu in carrying out at the Creation the mandates of Thoth the divine intelligence; his name means the opener. He is called the exceedingly great God, the beginning of being, the father of fathers and power of powers, he created his form, and gave birth to his body, and established an unending and unvarying right and truth upon the earth. As a solar God he is called Ptah, the Disk of heaven who illumineth the world by the fire of his eyes. In his hands he holds a sceptre on top of which are the emblems of power, life, and stability. He is the chief member of the triad Ptah-Sekhet and Nefer-Tmu. Seker is a solar God, He holds in his hands, emblems of power, sovereignty and rulership. (Ptah-Seker-Ausar) Creator of the world and the sun. Khnemu worked with Ptah carrying out the work of creation ordered by Thoth, his name means to mould, or to model. The chief God of the inundation and lord of the cataract at Elephantine. 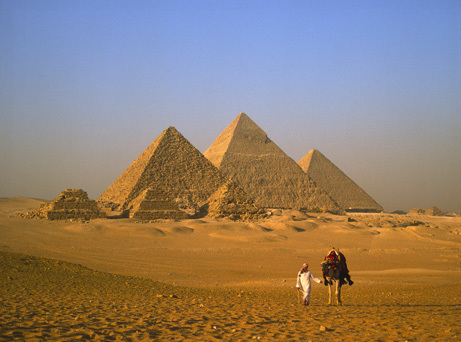 He dwelt in Annu, but he was lord of Elephantine. The builder of men, the maker of Gods, and the Father from the beginning. Maker of things which are, creator of what shall be, the beginning of beings, Father of fathers, and Mother of mothers (YX). Earth, Air, Sea and Sky are his handiwork. He is a man, in one hand he holds the sceptre and in the other the emblem of life. He also holds the emblem of water in each hand. Khepera was a form of the rising sun, of matter which is on the point of passing from inertness into life, and also of the dead body which is about to burst forth into a new life in a glorified form. He is depicted in the form of a man, to be self-begotten and self-produced. Tum or Atemu the closer, was the great God of Annu, and the head of the great company of the Gods of that place. He is called in the Divine God, self-created, maker of the Gods, creator of men, who stretched out the heavens, the lightener with his two eyes. The cool breezes of the north wind, always depicted in the form of a man; he wears the crowns and holds both the sceptre and emblem of life. Ra is the name given to the sun the attribute, Ra is the visible emblem of God, Ra is entreated to give it a place in the bark of millions of years, representing the victory and the truth over falsehood. Ra is depicted in the form of man with the head of a hawk. Ra is united with Tmu to form the chief God of Annu, and at the same period a female counterpart Raat was assigned to him. Shu is a member of the company of the Gods Annu, the firstborn son of Ra, Ra-Tmu, or Tum, by the Goddess Hathor, the sky and is the twin brother of Tefnut. He is a man, who wears upon his head a feather, and holds in his hand a sceptre, He is accompanied by the four pillars of heaven the cardinal points. Tefnut a member of the company of the Gods of Annu, the daughter of Ra, Ra-Tmu, and twin sister of Shu, she represents moisture, and personifies the power of sunlight. She is woman with the head of a lioness surmounted by a disk with uraeus. Shu carried away hunger form the deceased, and Tefnut carried away thirst. Seb or Qeb a member of the company of the Gods of Annu, is the son of Shu, husband of Nut, and by her father of Ausar, Auset, Set and Nephthys. He is called the father of the Gods and the tribal hereditary head of the Gods. He is depicted with a crown upon his head and sceptre in his right hand. Ausar a member of the company of the Gods of Annu the son of Seb and Nut and husband of Auset, the father of Heru, the son of Auset, and brother of Set and Nephthys. Ausar is a form of the sun God and represented the sun after Set as is an emblem of the motionless dead. He is represented in the form of a mummy wearing a crown and holding in his hands the emblems of sovereignty and power. Auset a member of the company of the Gods of Annu, is the wife of Ausar and the mother of Heru; the great Goddess and divine mother of the mistress of charms and enchantments. She is united to the star Sothis, and a star is added to her crown. She is represented as the mother suckling her child Heru. As a nature Goddess and the deity of the dawn, standing in the boat of the sun. Heru the Sun-God; totally distinct God from Heru, the son of Ausar and Auset, Heru the Sun-God wages against the night and darkness also has combat with Heru on his side, the son of Auset against his brother Set. The principal forms of Heru the Sun-God, are: Heru-ur, or Heru the Great; Heru-merti or Heru of the two eyes of the sun and moon; Heru-nub, the golden Heru; Heru-khent-khat; Heru-khent-an-maa, Heru dwelling in blindness (Total Eclipse); Heru-khuti, Heru of the two horizons (The Sphinx). Heru-sam-taui; Heru the uniter of the north and south. Heru, the son of Ausar and Auset, the child Heru, the avenger of his father Ausar, who now occupies the throne. (Heru-p-khart, is always represented as a baby with a finger in his mouth). Set also a member of the company of the Gods of Annu, is the son of Seb and Nut, and the husband of Nephthys. He is always mentioned with Heru and the other Gods of the Heliopolitan company in terms of reverence. Depicted as a man with the head of an animal that is not of this time on earth or not of this earth. A figure of the God in bronze in the British Museum and elsewhere proved beyond a doubt that the head of Set is that of an animal unknown to earth. In the first dynasties he is a beneficent God, whose favour is sought after by the living and by the dead as late as the 19th dynasty. (1st to the 19th dynasty) All called themselves the beloved of Set, around the 22nd dynasty he is regarded as the God of all original evil. Set or Sut represents the natural night and is the opposite of Heru. Nebt-het or Nephthys is the last member of the company of the Gods of Annu, is the daughter of Seb and Nut, the sister of Ausar and the wife of Set. She is a nature Goddess in the form of a woman, having upon her head the hieroglyphics which form her name Queen or Lady of the house. She is the mother of Anpu or Anubis. 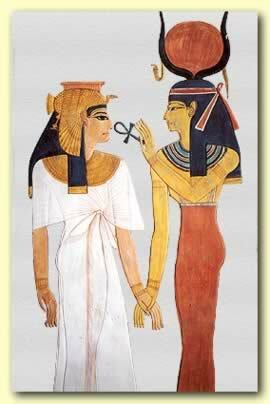 Nephthys is the companion or friend to Auset in her grief over the death of Ausar. Anpu or Anubis, the son of Ra, by Nephthys, represented as a nature God of the twilight and earliest dawn. He is depicted in the form of a man with a Jackal head or as a Jackal. He is the God of the sepulchral chamber and the funeral mountain, he is also the messenger of Ausar, he is also the opener of the ways. Hu and Saa the children of Tmu or Tmu-Ra, they are also nature Gods. Tehuti or Thoth represented the Divine intelligence which at creation uttered the words that were carried into effect by Ptah and Khnemu. He was self-produced, the great God of the earth, air, sea and sky and he united in himself the attributes of many Gods. The scribe of the Gods, the inventor of all the arts and sciences. Lord of writing, master of the papyrus, maker of the palette and the ink-jar, the mighty speaker, the God of right and truth, chronologer of heaven and earth, God of the moon, the reckoner of time, the measurer, he has the power to grant life for millions of years. When the great combat took place between Heru, the son of Auset, and Set, Thoth was present as judge, and he gave to Auset the cow head. He is called Ap-rehui, the judge of the two combatants. Thoth is in the form of a man with the head of an ibis sometimes mounted by the crown or disk or horns or he holds in his left hand the sceptre and in the right the Ankh also holding the ink-jar and the crescent moon. Sometimes he is in the form of an Ape holding a palette full of writing-reeds. Maat, the wife of Thoth, is the daughter of Ra, and a very ancient Goddess; she assisted Ptah and Khnemu in carrying out rightly the work of creation ordered by Thoth. Maat is right, true, real, genuine, upright, righteous, just, steadfast and unalterable. Maat the Goddess of the unalterable laws of heaven, and the daughter of Ra, is depicted in female form, with the feather emblematic of Maat, on her head, and the sceptre in one hand, and the ankh in the other. Het-heru or Hathor the Goddess of the sky, love, beauty and happiness, depicted in the form of a woman have disk and horns upon her head. She took on the form of a Cow the sacred animal and she provides food and drink for the deceased. Meht-urt is the personification of that part of the sky wherein the sun rises, and slos of that part of it in which he takes his daily course; she is depicted in the form of a cow. Net or Neith the Devine mother, mistress of the Gods, and mother of Sebek. She is depicted in the form of a woman, wears a crown and holds arrows a bow and a sceptre in her left hand; she also appears in the form of a cow. Sekhet the wife of Ptah, and the mother of Nefer-Tmu and of I-em-hetep. She is the personification of the burning heat of the sun, and as such was the destroyer of the enemies of Ra. Bast the mother of Nefer-Tmu, the Goddess is depicted with a cat head. She is the personification of the gentle and fructifying heat os the sun, as opposed to that personified by Sekhet. Nefer-Tmu the son of Sekhet or Bast, depicted in the form of a man, he stands upon the back of a Lion. Neheb-ka is the name of a Goddess who is represented with the head of a serpent, and whom the deceased identifies their self with. Sebak must be distinguished from Sebak the companion of Set, the opponent of Ausar; for each of these Gods the crocodile is the sacred animal. Amsu or Amsi is one of the most ancient Gods of Khemet. He personifies the power of generation and the reproductive force of nature, he is the father of his own mother, (Quote from Father Allah; 'what is woman but my daughter, i'll give her away if I want too'). He is depicted in the form of a man, he holds the flail in his right hand, which is raised above his shoulder. Neb-er-tcher Implied the God of the Universe. Un-nefer The God of the good being. Astennu is a name given to the God Thoth. Mert the lover of silence, she is depicted as a woman having a disk and horns. The God Amen, his wife is Mut, and their associate Khonsu, The name A-men means the hidden one, and first member of the great Theban triad of the 17th dynasty. Amen is the chief God of Thebes, the King of the Gods. The personification of the mysterious creating and sustaining power of the universe, which in a material form was typified by the Sun.